Hao Datong, one of the Seven Supreme Taoists in Quanzhen Taoism, is well known in China. He once traveled to Wozhou in today's Hebei Province in northern China. There he sat still in meditation under a bridge for six years. During that time, naughty children made fun of him but he was not bothered. The children even piled stones on top of his head yet he was still not disturbed. When the river rose he did not leave but nonetheless remained safe. That is to say, he was a person with high tolerance and supernormal abilities. Hao Datong was a disciple of Wang Chongyang, the master of Quanzhen Taoism. After Wang Chongyang passed away and became a Taoist god, his seven disciples separated from one another and traveled around. Hao Daotong went to various places and survived by begging for food. One day Wang Chongyang descended into the human realm in the form of a young adult and told Hao Datong that only by digging caves in a mountain and cultivating in them could he reach enlightenment. Hao Datong followed his teacher's words and went to Hua Mountain in central China. He spent three years digging the steep western slope. While digging the cave, two disciples began to follow him: Meiliang and Zhuqing. These two disciples helped Hao Datong dig the cave and worked very hard. Hao Datong was also responsible to them. When they completed the cave, they named it Purple Rose Cave and prepared to cultivate in it. Unexpectedly as soon as Purple Rose Cave was finished, an elderly Taoist monk arrived and said, “Your cave looks very nice. I do not know how to dig a cave; can I borrow this cave to cultivate here?” Hao Datong agreed and gave the cave to him. The two disciples became upset but could not do anything since their teacher had already agreed. Hao Datong and his two disciples went to another part of the mountain to dig a cave. As soon as the second cave was finished, another fellow Taoist came and asked for it. In this way, one cave after another, Hao Datong and his two disciples gave away the caves they dug. Hao Datong and his disciples spent more than 40 years digging, completing 70 caves, but they still had no place to settle for their cultivation. 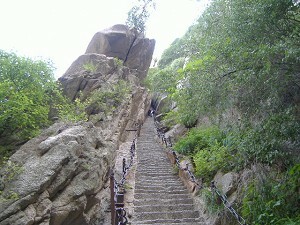 Hao Datong led his two disciples to a cliff on Hua Mountain called Nieniechuan. He asked his two disciples to hold a rope with which he lowered himself down the cliff to dig a cave on the side of the cliff. These two disciples had originally planned to follow Hao Datong to cultivate themselves into Taoist gods but throughout the years, they only helped Hao Datong dig caves to give away to other people while learning nothing about the Tao. They wanted to quit, but they did not want Hao Datong to see them leave. Since Hao Datong was down the cliff, the two disciples thought it was a good opportunity to leave. They cut the rope, leaving their teacher down on the side of the cliff and immediately left with their belongings. As they walked away, passing a boulder, they saw Hao Datong walking nonchalantly towards them. The two disciples immediately realized that their teacher had reached enlightenment, and so they felt great regret.